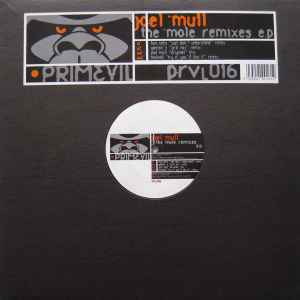 Joel Mull ‎– The Mole Remixes E.P. ℗ & © 1999 Primevil Recordings. Original track written and produced in 1998. Special thanx to Conform, Theory & Primate for their co-operation in this project. Matrix / Runout (Etchings Side A): MPO PRVL 016 A1 THE EXCHANGE - NILZ. Matrix / Runout (Etchings Side AA): MPO PRVL 016 AA1 THE EXCHANGE - NILZ. One of the best swedish techno ep's! It's really hard to find a record with almost all great tracks on it. Usually it's one or mostly two good tracks on a record, and that's it. But this one - all tracks (except maybe Gaeteks remix) are bombs! Pure swedish rhytm & groove. If you're into swedish techno (eg. Drumcode or H. Productions), this will be more than satisfying for you. A beaut! Joel Mull's best ever! Original is very good, but the master of all remixes ( mr. Ben Sims) adds an extra thrill with his 'Just Don't Understand Remix'. my copy has a remix by 'Melro6' called "try it, you'll like it"...... so i did, and... i did. But they're all blinding.